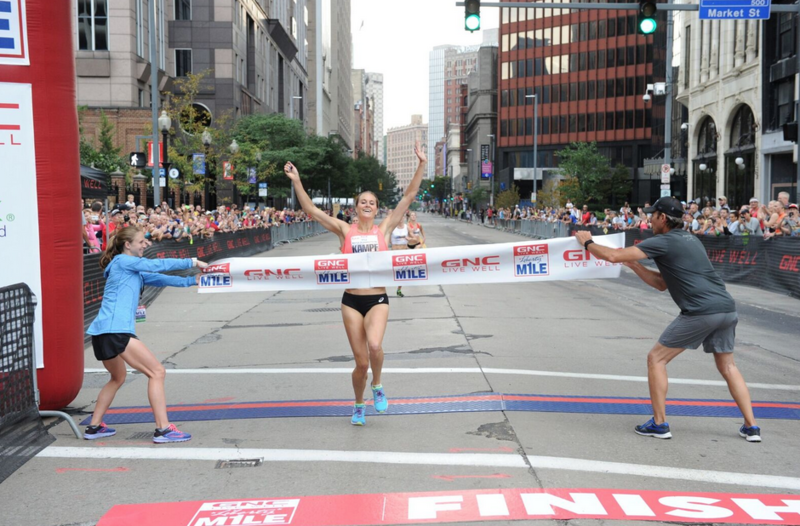 The GNC Live Well Liberty Mile is returning for another great year in the Steel City. Mark your calendars for 7 p.m. on Friday, July 20, so you can be a part of the fastest road race in Pittsburgh! Recently named one of The 35 Most Iconic American Road Races, the GNC Live Well Liberty Mile is designed to be short, fast and fun for everyone. Whether you choose a heat, take a seat or meet and greet — participants, spectators and volunteers alike will enjoy this unique one-mile race down Liberty Avenue in the heart of Downtown Pittsburgh. Now is your chance to join the 113,000 finishers, countless spectators and many volunteers who annually participate in a one-mile race. There are 1,350 one-mile events across the country, but the GNC Live Well Liberty Mile is the one race of the bunch you won’t want to miss. The One for Fun Mile presented by Fleet Feet Sports Pittsburgh is all about having fun and enjoying the run. Whether you are running the mile for the first time or are a recreational runner, this is the mile for you! The Pup Trot Mile presented by Humane Animal Rescue is open to dogs who love to run alongside their humans. The Kids of STEEL Mile presented by Brooks is perfect for Kids of STEEL program participants age 13 years old or younger. The Masters Mile presented by UPMC Health Plan is the competitive mile for athletes ages 40 and older who can run an eight-minute mile or faster. The Unstoppable Mile presented by Fleet Feet Sports Pittsburgh is the competitive mile for athletes ages 14 to 39 who can run a six-minute mile or faster. 2. If running isn’t your thing, you’re invited to hoot and holler to pump up the athletes and be part of the festival-like atmosphere. From helping with pre-race activities in Market Square to cheering on friends, family and perfect strangers at both the start and finish lines, volunteers and spectators are the heart and sole of this race. In fact, the GNC Live Well Liberty Mile wouldn’t be possible — or nearly as much fun — without them! 3. You can easily watch an entertaining and tight race between world-class athletes. Stick around to watch some of America’s fastest milers compete in the final two heats of the night — the men’s and women’s divisions of the Pro Mile presented by GNC Live Well. These heats will feature a deep field of sub-4-minute men’s milers and sub-4:30-minute women’s milers who will compete for one of the largest road mile prize purses in the country, including a $5,000 first place prize. 4. The party doesn’t stop once the final runner crosses the finish line. Everyone is invited to celebrate at the official post-race party at City Works Pittsburgh in Market Square. Runners will have a tear-off coupon on their bib for a complimentary Magic Hat #9 upon completing the race. Or you could head over to the Roberto Clemente Bridge for a culinary celebration of all things pickled. For the first time, the GNC Live Well Liberty Mile coincides with the popular Picklesburgh festival. We hear it’s kind of a big dill! 5. And did we mention the swag? All race participants will receive a commemorative t-shirt, goody bag filled with partner giveaways and coupons and post-race food. New this year, title partner GNC Live Well is giving away FREE items such as a recyclable tote, specially-designed GNC Live Well Liberty Mile shaker bottle and more. Bring friends, battle for bragging rights and experience the dynamic Steel City the best way we know how — on foot! The first of six heats will start at 7 p.m. on Friday, July 20; all adult registrations cost $30 and child registrations cost $15. Visit www.libertymile.org to choose your heat today before registration closes on July 13! 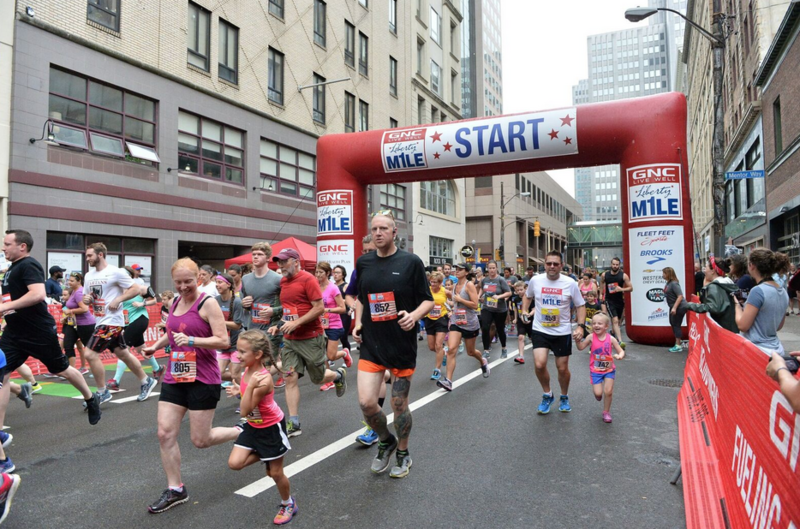 The post 5 reasons you won’t want to miss the Liberty Mile appeared first on NEXTpittsburgh.